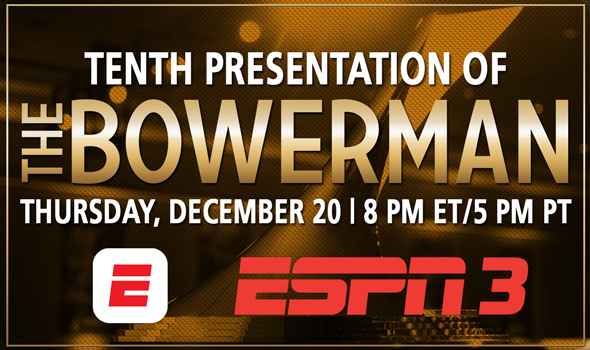 NEW ORLEANS – The U.S. Track & Field and Cross Country Coaches Association (USTFCCCA) is pleased to announce that the tenth presentation of The Bowerman will be carried live on ESPN3 and the ESPN App. Originating from the JW Marriott San Antonio Hill Country Resort & Spa, the celebration of collegiate track & field’s most prestigious award will take place on Thursday, December 20, starting at 8 p.m., Eastern. It will mark the first time in award history that the presentation will be aired live on ESPN’s networks. ESPN SportsCenter anchor John Anderson will return as lead host for the seventh time. Well known to the track & field and running community, Anderson has been track-side reporter at past installments of the NCAA Division I Indoor and Outdoor Track & Field Championships and is the play-by-play voice of the TCS New York City Marathon. The Bowerman is collegiate track & field’s highest individual honor and is awarded annually to one male and one female athlete who were the most outstanding during the collective indoor and outdoor seasons. The winners are determined by a vote among media personnel, statisticians, collegiate administrators, and past winners. Since its inception in 2009, The Bowerman has been awarded to the “who’s who” of the track & field world. Past winners include two-time Olympic gold medalist and former decathlon world record holder Ashton Eaton (2010), 2016 Olympic gold medalist Brianna (Rollins) McNeal (2013), two-time Olympic medalist Galen Rupp (2009), two-time Olympic medalist Derek Drouin (2013), and 2016 Olympic bronze medalist Jenny (Barringer) Simpson (2009), among others. Former Tennessee standout, 2017 World Championship silver-medalist, and indoor world record holder Christian Coleman and former Oregon star and 2018 World Indoor Championship gold medalist Raevyn Rogers are the reigning winners of The Bowerman. Sixteen of the 18 past winners are scheduled to appear at the ceremony. The 2018 class of Bowerman Finalists have already compiled a bevy of accomplishments on the collegiate and international stages. This year’s men’s finalists are Rai Benjamin and Michael Norman of Southern California and Florida’s Grant Holloway. On the women’s side, the finalists are Arizona State’s Maggie Ewen, Kentucky’s Sydney McLaughlin, and Georgia’s Keturah Orji. Benjamin smashed the 13-year-old collegiate record held by 2016 Olympic gold medalist Kerron Clement en route to winning the NCAA title in the 400 meter hurdles. His remarkable run of 47.02 seconds was the fastest the world had witnessed since 1992. Norman provided several breathtaking moments with worldwide impact. Individually, he bettered Clement’s indoor world and collegiate record in the 400 meters with a stunning 44.52 trip for the NCAA crown. His jaw-dropping 43.61 for the outdoor national title was another record-breaker and the fastest in the world in 2018. With Benjamin as the second-leg, Norman anchored the Trojans to heart-pounding, historic feats in winning the NCAA’s 4×400 relay championships. Their indoor crown was captured with an all-time world best — 3:00.77. As both split 43.6 outdoors, they clinched the national title in a collegiate- and meet-record: 2:59.00. According to Track & Field News, Norman’s 43.06 split at the NCAA Preliminary Rounds is second-fastest in world history behind only four-time Olympic gold medalist Michael Johnson. Holloway swept NCAA titles in the sprint hurdles, becoming only the second in NCAA DI history to do so in back-to-back years. Indoors, he glided to a 7.42 clocking in the 60 meter hurdles to top the collegiate record set by 2016 Olympic gold medalist Omar McLeod. At the SEC Outdoor Championships, Holloway’s 13.15 in the 110 meter hurdles landed second on the all-time collegiate list behind only Renaldo Nehemiah. Indoors, Holloway was the national runner-up in the long jump and, with a 44.91 split, helped the Gators to a third-place showing in the 4×400 — all of which aided Florida’s capture of the national team title. Ewen, now twice a finalist for The Bowerman, claimed three NCAA crowns in 2018: The shot put — indoors and out — plus the discus. At the Pac-12 Championships, she swept titles in the shot, discus, and hammer, becoming the first in the conference’s history to do so in back-to-back years. Ewen twice topped her own collegiate record in the hammer (244-6/74.53m) and added more than five inches to the collegiate outdoor shot put record (63-10¼/19.46m), previously held by 2016 Olympic finalist Raven Saunders. Ewen is the first woman since 2016 Olympic bronze medalist and 2009 Bowerman winner Jenny (Barringer) Simpson to simultaneously hold collegiate records in at least two individual events. McLaughlin, winner of this year’s IAAF Female Rising Star Award, dazzled in her first and only collegiate campaign. Only a freshman, she broke the collegiate record in the 400 meter hurdles set by 2017 World Champion and 2013 Bowerman finalist Kori Carter in claiming the SEC crown in 52.75, a mark that also toppled the former World U20 record by more than a second-and-a-half. Also, she twice set all-time U20 bests indoors in the 400 meters including her NCAA finals run of 50.36, where she came within .02 from the national title and the collegiate record set by USC’s Kendall Ellis. Orji is the first three-time female finalist for The Bowerman and was recently named 2018 NCAA Woman of the Year. With a sweep of triple jump crowns and a long jump outdoor title, she added three NCAA titles to her career ledger, bettering her own triple jump collegiate records indoors (47-8/14.53m) and outdoors (47-11¾/14.62m) along the way. Adding a runner-up indoor national showing in the long jump, Orji tallied 38 team points in national championships, vital to Georgia’s clinch of the indoor national team title. In her incredible collegiate career, she tallied eight individual NCAA titles — the all-time DI women’s leading total among field athletes. Orji became the fourth woman in DI history — and the first in the triple jump — to win a single event at four-consecutive NCAA Outdoor Championships. In addition, she completed the rare “octo-sweep” of SEC triple jump titles, winning indoor-and-outdoor conference crowns each year. In the collegiate triple jump record book, she owns eight of the top ten marks in history indoors and six of ten outdoors. The U.S. Track & Field and Cross Country Coaches Association (USTFCCCA) is a non-profit professional organization representing cross country and track & field coaches. The organization represents over 10,000 coaching members encompassing 98% of all NCAA track & field programs (DI, DII, and DIII) and includes members representing the NAIA, NJCAA, as well as a number of state high school coaches associations. The USTFCCCA serves as an advocate for cross country and track & field coaches, providing a leadership structure to assist the needs of a diverse membership, serving as a lobbyist for coaches’ interests, and working as a liaison between the various stakeholders in the sports of cross country and track & field.